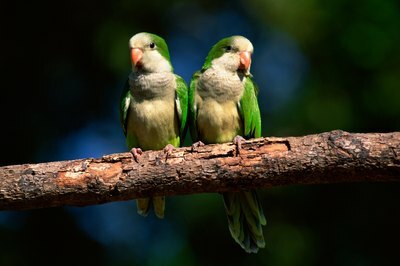 Quaker parrots are also known as monk parakeets. When thinking of a Quaker parrot, are you envisioning a bird with a head of snowy white hair, rosy cheeks and a black hat? Quaker parrots didn't get their name because they belong to a group that shares religious ideals, or from eating oatmeal. It's because they quake. Quaker parrots are quirky little birds with their own unique style. For example, whereas most other wild parrots find holes in trees to fix up and make their home, the Quaker actually builds a nest of sticks and twigs much like other wild birds. Not only that, but the nests are unique in that they are more like suites than nests. They have three separate areas: an incubation room, plus a sort of living room and front porch. These parrots become sexually mature at about 1 to 2 years of age, and lay four to eight eggs at a time that incubate for 23 to 26 days. The babies begin fledging when they are 6 to 8 weeks old. The Quaker parrot is a small member of the parrot family, growing to about a foot in length, the size of an average cockatiel, but heavier. They are green, with some gray on forehead, cheeks, throat and chest. They look quite dapper, with white ticking on the breast feathers and shades of blue on the tail and flight feathers. The juveniles, males and females all have similar coloring, making them different from many wild birds: one gender, usually the male, is generally more brilliantly colored than the other. There are color mutations, and where they occur, the price of the bird is considerably higher. The mutations include shades of blue, yellow and cinnamon. The Quaker parrot shakes and quakes, as if doing some weird dance move. Ergo the name. If you've ever been attracted to the "bad boy" type, this just may be your new soul mate. Quaker parrots have been banned as pets in several states and owning them will get you in some serious trouble with your state's fish and wildlife commission. They are amorous birds who proliferate quickly, so there are fears they will take over, ruin crops and run native wildlife out of town. Because they are so hardy, Quakers can live in cold climates and there are feral colonies living it up in several states. However, Quaker enthusiasts are quick to point out that these birds have an unusual nesting instinct that keeps them close to each other, so the prospect of widespread havoc is unrealistic. Quakers are notoriously loud and noisy birds, the rock star of the pet bird scene. They are also fearless little Houdinis who like to find their way out of the cage so they can chase your Rottweiler around the house. They are fearless, intelligent and vociferous, having the ability to imitate not only words, but all kinds of sounds such as the vacuum cleaner, telephone and cat's meow. They can live up to 20 years in captivity if well cared for. They need a large cage (18 by 18 inches is considered the very minimum), a healthy, varied diet and lots of toys to keep them happy so you can enjoy the relative quiet of a bird who entertains himself. Heaven help you if your Quaker gets bored, because this is a bird who will not be ignored. Why Are Cats So Lazy?